Taking a trip to Tokyo but don’t know where to stay? This article introduces eleven areas that offer great accommodation facilities along with some of the best sightseeing and amusement spots in Japan’s metropolitan capital. Planning a trip to Tokyo is exciting, but it's also a big task to handle for many visitors. Due to Tokyo's massive sprawl, it might be especially difficult to decide where to stay. We introduce 11 areas inside Japan's great metropolitan capital to fit your travel style and trip goals. Tokyo can be overwhelming to navigate at first glance, so it is important to plan your lodging ahead of time. Place yourself in an area by public transportation - if you will be using a Japan Rail Pass, you will want to find lodging next to a JR (Japan Railway) train station. Base your accommodation on your travel interests, since each neighborhood of Tokyo varies from one to the next. Areas with the most lodging facilities include Asakusa in eastern Tokyo, and Shinjuku in western Tokyo. In general, travelers will find lodging rates in eastern Tokyo lower than rates in western Tokyo. Rates for ryokans and hotel rooms vary in price. Hostels, capsule hotels, and certain AirBnB options are suitable for those operating on a budget. In Tokyo, there are a variety of accommodation options to suit a large variety of visitors’ needs and budgets. For an in-depth review of the different types of lodging in Japan, check out Finding A Place To Stay In Japan - Types Of Accommodation Facilities. Hotels - A typical hotel in Tokyo offers western-style sleep accommodations and amenities. A standard hotel room in Tokyo will cost from 5,000 to 26,000 yen per night. In addition to standard hotel rooms, however, you may also come across business hotels and love hotels, which are targeted to workers on business trips and to couples. These two categories are less recommended for travel purposes. Ryokans - Ryokans are traditional Japanese-style inns which have rooms with tatami flooring and Japanese traditional bedding (futon). Many lodgings also have the option to add a Japanese breakfast and dinner to your plan. Prices in Tokyo range from 6,000 to 30,000 yen per night. AirBnB - In recent years, AirBnB has become more widely used in Japan and especially in Tokyo. You can find lodging options ranging from renting out entire apartments to individual rooms, to hostel-style accommodations. Hostels - With rates lower than traditional hotels, hostels are a budget-friendly style of lodging and also provide an excellent opportunity to travelers wanting to make social connections. A typical hostel will offer private to semi-private sleeping quarters and shared washrooms, along with shared recreational spaces. Capsule hotels - Capsule hotels provide travelers with a small, capsule-shaped bed area. The restroom and washroom areas are usually shared with other guests. Some capsule hotels are male-only, but there are also female-only capsule hotels as well. Located in eastern Tokyo within the Taito ward, Asakusa and Ueno have a lot to offer visitors. Asakusa has been a center of commerce and traditional arts within Tokyo since the Edo era (1603 - 1868). Next to Asakusa is Ueno, which has also played an important role in Tokyo’s history as a city. 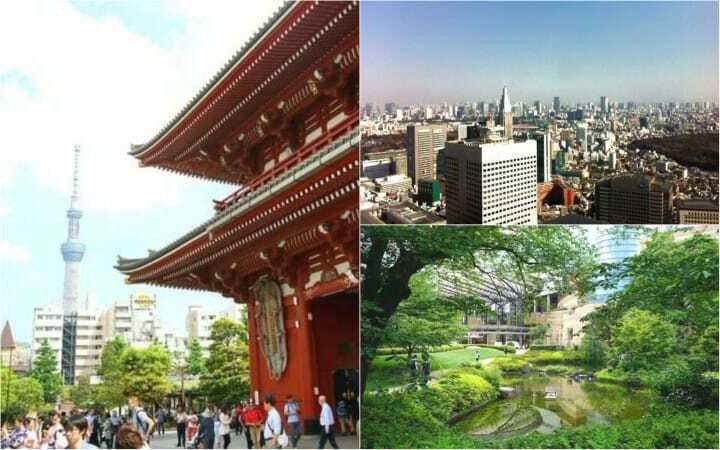 These areas hold some of Tokyo’s most well-known attractions, including Sensoji Temple, Ueno Park, and Tokyo Skytree. There are also a number of museums, including the Tokyo National Museum, Tokyo Metropolitan Art Museum, and the National Museum of Nature and Science. Narita Airport is also easy to reach if you are staying in the Asakusa and Ueno areas. There are a number of ways to get to and from Narita Airport from the Keisei Ueno Station, including express trains and normal trains. With the Keisei Skyliner (the Keisei express train), it takes 41 minutes to reach Narita Airport Station, and it takes roughly 70 minutes via ordinary train. For more information about how to get to Narita Airport, look at Pick The Right Train! Going From Keisei Ueno Station To Narita Airport. Tokyo Station and the Marunouchi area is ideal for visitors with plans to use the shinkansen and traveling throughout the rest of Japan. The close vicinity of this massive transport hub makes getting to your travel destination, whether within Tokyo or in another part of Japan, easy. Tokyo Station and the surrounding areas also feature number of underground shopping malls with shops perfect for souvenirs and gifts. We also recommend sightseeing in the area from the street-level. Don’t miss the view of the iconic red brick Tokyo Station building, built originally in 1914 and deemed as an Important Cultural Property in Japan. Ginza, positioned in central Tokyo in the Chuo ward, is another well-known area of the city. It is an upscale, luxurious neighborhood that boasts high-end department stores, designer shops, and sophisticated cafes. In the 17th century, Ginza prospered as a silver mint and became known as a shopping area with imported European goods. World-famous department stores, including Mitsukoshi and Matsuya, were introduced first in Ginza in the early 1900s, establishing the neighborhood as a prosperous area. Ginza is a perfect area for strolling and window shopping, especially on the weekends, as Ginza Street closes off vehicle traffic and opens up to pedestrians. Among the endless shopping options in Ginza, we recommend checking out G. Itoya, a famous stationery shop with 12 floors, including a café on the top floor featuring dishes made with in-house, hydroponically-grown vegetables. Accessing other areas of Tokyo is also very easy from Ginza, as the area is serviced by the Tokyo Metro Ginza, Marunouchi, and Hibiya metro lines. The closest JR (Japan Railway) station is Shimbashi Station, which is on the JR Yamanote Line, a line that circles the city, reaching all major neighborhoods in Tokyo. Picture from Is It A Hostel? A Bar? A Lounge? Presenting CITAN At Nihonbashi Area! Nihonbashi, located close to Tokyo Station, is another area that we recommend for visitors due to its central location. This neighborhood has been a popular business district since the Edo area (1603 - 1868). As a result, the Nihonbashi area has flourished with a variety of shops and restaurants, and offers a variety of hotels and various types of accommodations. In particular, the area is known for its hostels, suitable for travelers who want to socialize and relax in the company of other guests. Is It A Hostel? A Bar? A Lounge? Presenting CITAN At Nihonbashi Area! Picture from Morning To Night In Akihabara - Get Your Anime, Manga, And Gaming Fix! Akihabara, known especially for its “Electric City,” is the center of Japanese otaku culture and technology in Tokyo, if not all of Japan. It is a popular area within Tokyo and is ideal for visitors who wish to enjoy this area of Japanese culture and shopping for Japanese anime, manga, and electronics. Akihabara is centrally located in Tokyo and is close to Ueno and Asakusa, making this area accessible and convenient for travelers. It is also a stop on the JR Yamanote Line. Morning To Night In Akihabara - Get Your Anime, Manga, And Gaming Fix! Picture from Ecute Shinagawa - A Shopper's Paradise In Shinagawa Station! Shinagawa, like Tokyo Station and Marunouchi, is an area ideal for visitors visiting multiple spots in Japan. Located in southwestern Tokyo, Shinagawa is relatively close to the neighboring cities of Kawasaki and Yokohama in Kanagawa Prefecture. The main draw of this area is its close proximity to Haneda Airport. A convenient and quick way to reach Haneda Airport is via the Keikyu Line, which will allow you to arrive in just 11 minutes from Shinagawa Station. Shinagawa is also a major shinkansen stop, making it easy to travel throughout Japan. A great transportation hub in Tokyo, there are also a large number of accommodation options in the area to suit a variety of visitors’ demands. Ecute Shinagawa: A Shopper's Paradise In Shinagawa Station! Roppongi is an upscale and cosmopolitan neighborhood located in the Minato ward of Tokyo. Visitors who want to experience a modern and refined side of Tokyo will enjoy the fine dining options and museums in Roppongi. The vibrant nightlife in the area is also well-known. One of Roppongi’s main attractions is Roppongi Hills, a shopping and dining complex featuring the Mori Art Museum and an observatory with beautiful views of Tokyo Tower. Roppongi is close to the Tokyo Metro Hibiya Line and the Toei Subway Oedo Line. Shibuya is a large, popular area in western Tokyo known for its vibrant, youthful culture and plethora of entertainment. Shibuya is one of Tokyo’s 23 wards, and encompasses several famous neighborhoods including Harajuku, Yoyogi, and Daikanyama within its area. Shibuya Station is a major transportation hub in Tokyo, serviced by a number of JR lines as well as Tokyo Metro and other private railways. Along with endless shopping and dining options, visitors staying in Shibuya can take part in experiencing the Shibuya Scramble Crossing, a world-famous crossing used by around five million pedestrians each day. Visitors staying in Shibuya can experience this throughout their stay. Shibuya Guide: Enjoy Tokyo's Youth-Oriented District To The Fullest! Shimokitazawa, located in western Tokyo in the Setagaya ward, is a neighborhood suitable for visitors searching for a relaxing and off-the-beaten-path type of stay in the city. This youthful and artistic area a short train ride away from Shibuya Station via the Keio Inokashira Line, separating it from the bustle of the larger neighborhoods of Tokyo without being inconvenient or isolated. Shimokitazawa is home to many second-hand shops, galleries, live music venues, and cozy cafes, with plenty of entertainment options. Visitors wanting to experience an artistic and alternative side of Tokyo in a quiet area should consider staying in this area. Shinjuku is another iconic neighborhood in Tokyo and popular for visitors in Japan. Located in western Tokyo, just past Shibuya on the JR Yamanote Line, Shinjuku provides visitors with flourishing entertainment and many lodging options in a convenient neighborhood. In addition to shopping, well-known attractions include Shinjuku Gyoen, an extensive park with Japanese gardens, and the Robot Restaurant in Kabuki-cho. With an endless variety of entertainment and dining, staying Shinjuku is for travelers who wish to enjoy and be in the middle of city life in Tokyo. Ikebukuro is located in northwestern Tokyo, located a few stops away from Shinjuku on the JR Yamanote Line. Ikebukuro is also well-connected to the rest of the city with other JR lines as well as other private railways. The area is known for its extensive shopping complexes and restaurants and has become an active spot for both locals and travelers. In addition, like Akihabara, there are a number of shops in Ikebukuro that cater to anime and manga fans. Due to its growing popularity, the area has many lodging options for visitors. Ikebukuro Guide: Access, Shopping, Amusement, Hotels, And More! Tokyo is home to an endless amount of entertainment, dining, and attractions, and offers an equally large number of accommodations to its visitors. With so many options it may be hard to choose where to base your stay, but keeping in mind your trip goals and travel destinations in mind, you will be able to find the perfect accommodation in Tokyo.